Castellina Southern Highlands - Cost effective solar lease in place. Buyer assumes lease. MLS#2081174. Nationwide Realty LLC. Siena Ancora Southern Highglands - Sensational pool, spa & waterfall. Mountain views throughout MLS#2080446. BHHS Nevada Properties. Royal Highlands At Southern Highlands - Too Much To List Must See MLS#2080768. Platinum R.E. Professionals. Estates At Southern Highlands - Gourmet kitchen is open to the living room. Best Strip and mountain views MLS#2080080. Couture Realty. Park Paseo Southern Highlands - Large Master Bedroom with bay window. New carpet & vinyl. Fresh paint. MLS#2079928. PropertyMax Group LLC. Bella Terra At Southern Highlands - Come See This Beauty You Won'T Regret It! MLS#2079761. United Realty Group. Belmont Park - Upstairs is new carpet, expansive master suite and guest bedrooms. MLS#2079849. ERA Brokers Consolidated. Sienna Vista Southern Highlands - Don't miss out, Make an offer today! ! MLS#2079523. BluePrint Realty LLC. Bella Terra At Southern Highlands - Low Maintenance Desert Landscaping In Backyard Is Perfect For Enjoying Summer Evenings! Welcome Home!! ! MLS#2079770. ERA Brokers Consolidated. Beazer Souther Highlands - This is an amazing home for the entertainer at heart! Call Patty to view MLS#2079115. Shelter Realty, Inc.
Siena Ancora Southern Highglands - This Property Is A Must See! ! MLS#2078109. NextHome Integrity. Mstr w/walk-in closet & beautiful french doors that lead to the fabulous yard~Tuff Shed w/electric power MLS#2078215. Simply Vegas. San Niccolo Southern Highlands - Finishes Include All New Custom Cabinets In Baths & Kitchen, Quartz Countertops, Glass Back Splash, Ss Appliances, Stone Fireplace Surround, Waterproof Laminate Flooring, Carpet, Under Mount Sinks, New Shower Enclosure, Light Fixtures, Baseboards, Window Coverings, Fresh Paint, New Water Heater ...Only Resale Home Like It In All Of Southern Highlands. MLS#2078635. Urban Nest Realty. Industrial Star Southern Highlands - Located in the master planned community of Southern Highlands, this home comes with wood shutters, surround sound, custom backsplash in kitchen & bathrooms, tankless water heater, vaulter ceilings, ethernet connections, gourmet kitchen, garage was the sales office with separate A/C and heating unit & surround sound (has been converted back to a garage), you name it....this home has it! MLS#2078340. BHHS Nevada Properties. Belmont Park - Walking path directly to park & Vassiliadis elementary school! Owner w/carry! MLS#2078504. eXp Realty. Foothills At Southern Highland - Located in a 24hr guard-gated community.minutes to downtown Summerlin.Newly remodeled home includes 4bdrs,3baths+office+bonus room.This beautiful home features 1st floor master suite w walk in closet,custom kitchen w quartz countertops,ss appliances,large island,built-in banquette,soft-close cabinets.great room w vaulted ceilings custom stone fireplaces,designer baths, laundry room w washer,dryer,freshly landscaped backyard w new swimming pool. MLS#2078288. RE/MAX CENTRAL. Royal Highlands At Southern Highlands - All measurements are approximately. Agent should verify before offering. MLS#2076069. Vegas 99 Realty. Kitchen is all stainless steel and granite with a huge island counter, all windows have ornate wood casing, solar screens throughout, solar panels, hardwood floors, master shower and bath has extensive tile work, backyard with loads of pavers & raised level for fire pit, fireplace in family room, etc...This is a turn key property! MLS#2077385. BHHS Nevada Properties. Entertainer's dream backyard - bocce ball, mini putting green & pond w/ waterfall on over-sized lot. MLS#2076853. Southern Highlands Realty Corp. 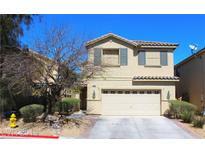 Via Dana At Southern Highlands - No carpet in the house!Covered patio downstairs and huge balcony with amazing view upstairs.Pool sized backyard. MLS#2077080. RE/MAX CENTRAL. San Vino At Southern Highlands - Enjoy a quiet and serene backyard with partially paved walkway, shaded patio, custom lighting, and custom-built BBQ island! MLS#2076842. Signature Real Estate Group.